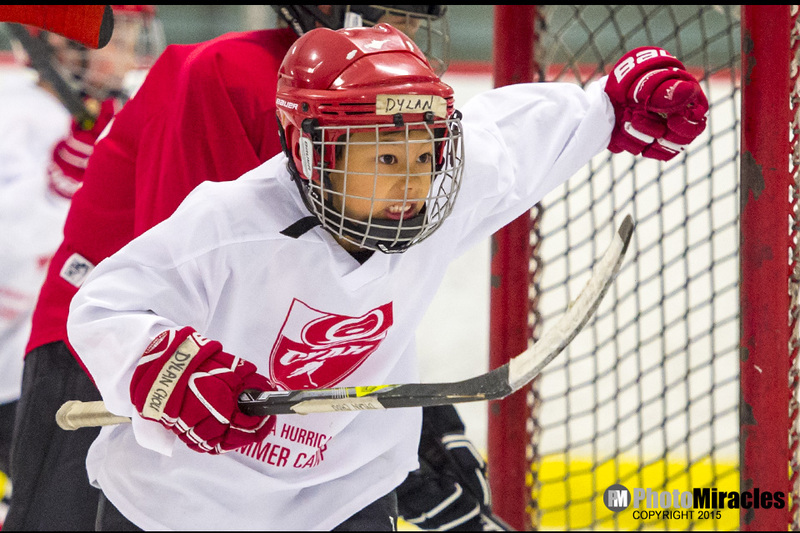 We’ve been working with the Carolina Hurricanes for their summer hockey camp, or Canes Camp as it is called, for 12 years. The campers run drills all week, culminating in a big game on Friday which is called by none other than the Canes’ TV play-by-play guy, John Forslund. The campers learn a lot about the game, and if they are lucky, get to meet a few NHL players. Shane Willis, who spent a few years in the NHL with the Hurricanes and the Tampa Bay Lightning, runs the camp. Helping out on the ice is Robert Kron, the Hurricanes’ European scout, who played for the Canucks, Whalers/Hurricanes and Blue Jackets. Brent Selman, head coach at Duke, runs the skating classes and typically coaches the winning team at Friday’s big game. The campers have been visited by several players in the past such as Rod Brind’Amour, Aaron Ward, Jesse Boulerice, Kevyn Adams, Cam Ward, Glen Wesley, Tom Barrasso and of course, NHL Hall of Famer and current team GM, Ron Francis. We always try to get a team photo with the players and campers often get autographs. We shoot drills and games all week, and then cover the Big Friday Game. Viewing stations are available for families to see the photos of their campers throughout the week as well as the game action minutes after the game is complete. All photos, as usual, are available on our website within 24 hours of the final game. We are also available to shoot your team’s game. Contact us for pricing and to schedule your team!